Every year in India, thousands of children are trafficked across the country to work long hours in highly exploitative conditions. Thanks to the efforts of official agencies, a small proportion of these children are rescued and returned to their home states. However, a recently released report by the Harvard FXB Center for Health and Human Rights reveals that despite these assiduous efforts, India’s system of “rescue and reintegration” fails to protect these highly vulnerable children. Based on a detailed survey conducted by the Indian non-profit FXB India Suraksha with 49 experts (from government and civil society) in the source state of Bihar, the transit state of Delhi and the destination state of Rajasthan, the Harvard report reveals startling inconsistency between existing policy and legal commitments, and on-the-ground realities. One of the most serious failings of the current system is the inadequate attention paid to reintegration. 96% of survey respondents said that each child’s individual case is closed within four months, with no follow up. Another problem is poor inter departmental coordination. Key agencies operate in isolation, rarely establishing collaborative networks with counterparts outside their own agency involved in the rescue and reintegration process. Lacking adequate training and oversight, actors routinely evade responsibility and deflect blame for protection failures. As a result, the substantial post-trafficking needs of children – safe accommodation, education, economic support and health care – are more often than not neglected. 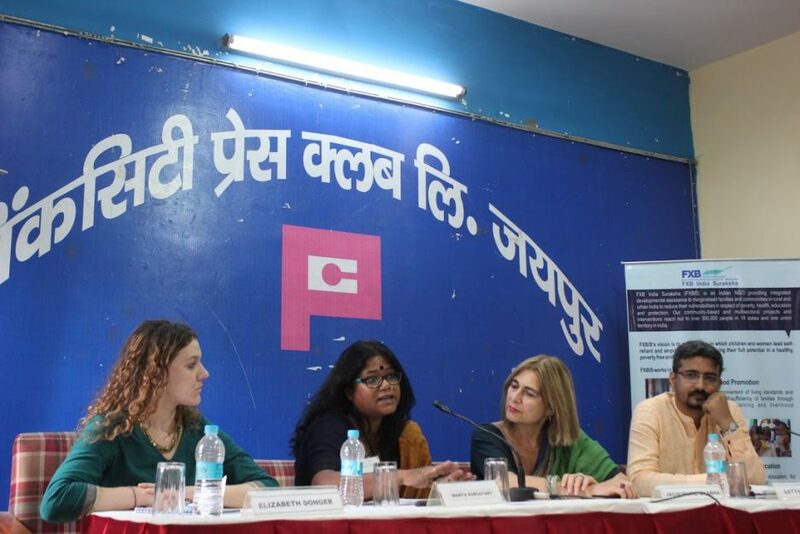 Between July 18 and 24, 2016, Harvard FXB Center convened three seminars on this important subject with prominent experts in Delhi, Patna and Jaipur from relevant government ministries, police, nonprofits and academia. The meetings disseminated the report’s findings and recommendations, and fostered discussion and collaboration among local anti trafficking leaders, geared to improving current practice. Several common themes emerged from the panels and discussion sessions. Successful action to combat trafficking, in many senses a shorthand for multiple protection failures, requires a holistic child welfare approach. “We cannot separate protection from prevention. This represents a false dichotomy,” said Dr. Shantha Sinha, founder of the pioneering Indian child rights non-profit MVFoundation and former chair of the National Commission for the Protection of Children’s Rights. Those present agreed that effective collaboration among departments is sorely lacking. They also noted the critical importance of bottom-up individual leadership to make use of existing resources and networks. Despite the enormous challenges raised by child trafficking, seminar attendees highlighted the potential of small steps to make a significant difference. For example, Ms. Neeti Daftari, of the nonprofit Aangan Trust, shared their success with a recent initiative to create Whatsapp groups connecting previously isolated Child Welfare Committees to organize interstate transfer of rescued children. Moving forward, use of new technologies in reintegration processes will be especially important, both to fill the serious data deficits that impede effective monitoring of progress, and also to allow for long-term holistic care plans for individual children. The seminars come at an important and dynamic time for anti-trafficking advocacy in India. In June 2016, a new anti-trafficking bill was published that fails to make mention of reintegration. This bill adds another layer of superfluous committees to an already crowded institutional landscape. In another recent development, India’s upper house of parliament on July 19 passed an amendment to India’s Child Labour Act that legalizes several forms of child work in “family businesses,” widely criticized as permission for dangerous child labor. Finally, the Supreme Court has ordered the creation of a new Organized Crime Investigating Agency by the end of the year to exclusively address trafficking cases. Our report authors and researchers, together with seminar participants agreed to collaborate on advocacy around these issues. The critical importance of integrated social and child protection to prevent trafficking in the first place was stressed repeatedly. Other agreed action items included improved and consistent training for all anti-trafficking caseworkers (including police officers, social welfare officials, labor inspectors and NGO workers) and more vigorous interagency efforts to support long-term reintegration and protection of at risk children. Only committed and sustained interventions of this sort will generate the effective protection that India’s most vulnerable children need and deserve.